"Listening to Marvin (All Night Long)"
There are 377 songs, recorded or written by Marvin Gaye currently on my iPod. I wouldn’t quite call myself a fan of the late artist, who would have turned 73 on April 2nd, but more like I have a serious relationship with the man’s music. That relationship, which I’m sure many share, says more about the timelessness of his art, as opposed to the charisma that still marks him as one of the most important male vocalists of the 20th Century. In tribute to Marvin Gaye and his music, here’s a list of songs that continue to reveal newness to me with every listen. Raised in a Pentecostal church, with a minister father, no one would have thought twice if a young Marvin Gaye decided to become a gospel singer, mirroring the choices of his peers including Sam Cooke and Lou Rawls. But Gaye’s ears were attuned to the street corner—where Doo-Wop captured the imagination of a generation of American boys—and his eyes fixed the images of Tin Pan Alley. When Gaye recorded the Soulful Moods of Marvin Gaye (1961) his first long-playing disc for Motown, it was filled with tracks “My Funny Valentine,” Cole Porter’s “Love for Sale,” and “Witchcraft”; simply put, Gaye wanted to be Frank Sinatra and Nat King Cole, even recording a tribute to the latter after his death in 1965. Once “Stubborn Kinda of Fellow” hit in 1962, it became clear to all that Gaye was going to have another career trajectory, but he never gave up on that desire to record his version of Sinatra’s In the Wee Small Hours of the Morning. In the late 1970s, Gaye contracted songwriter and arranger Bobby Scott (who had worked with Aretha Franklin on her Columbia sides in the 1960s) to produce a series of Big Band ballads. “Funny,” originally recorded for Doris Day’s Love Him (1963), marks the marriage of Gaye’s balladeer sensibilities with his Doo-Wop training, as advances in recording technology allowed Gaye to layer his voice in ways that Sinatra and Cole could have never imagined. 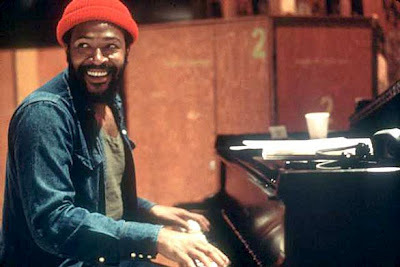 The seminal recording What’s Going On, marked the most dramatic leap in Marvin Gaye’s song-writing technique, as he benefitted from willing collaborators like James Nix and Al Cleveland and took every advantage of new studio technologies. The album is long remembered for pushing Motown politically and artistically into the future—Stevie Wonder’s run of landmark albums from 1972-1975 are practically unimaginable without Gaye’s intervention, as could also be said about Smokey Robinson’s Quiet Storm (1974). While side one of What Going On is perfectly pop as anything recorded in the early 1970s, side two found Gaye more introspective. “Wholy Holy” stands out for its unbridled spirituality, something that was not lost on Aretha Franklin, who featured the song on her Amazing Grace (1973) recording, as one of two “secular” songs on the album (the other was Carole King’s “You’ve Got a Friend”). In recent years John Legend (2010) and The Dirty Dozen Brass Band (2006) have recorded versions of the song. As Gaye continued to hear Doo-Wop in his head, he began to write for and produce Motown vocal groups like The Monitors (featuring one-and-future Temptation Richard Street), The Originals, who scored with Gaye’s “Baby I’m for Real,” and “The Bells” and the post-Smokey Miracles—groups that Gaye used as placeholders until he could perfect such harmonies in the studio using his own voice. “Just to Keep You Satisfied” was initially written with Gaye’s wife Anna Gordy Gaye, but by the time Gaye laid it down for Let’s Get It On, it was a document to the Gaye’s failing marriage. Gaye’s version feels like a dirge—a funeral for a once vibrant relationship, that fittingly closes Let’s Get it On. I remember hearing the song for the first time—I was 17 and in my first love affair—and wondering what kind of depth of love could produce such a haunting piece of art. Thirty years later, I’m still not sure I have an answer. There have been stellar renditions of the song, including by Randy Crawford (from her career defining Raw Silk), Nancy Wilson and Lisa Stansfield. With his first marriage ended, and Gaye needing pay back alimony to his first wife, even as his second marriage to Janis Hunter was fraying, Gaye agreed to use royalties from his next studio album Here, My Dear to meet his responsibilities. In classic Marvin Gaye fashion, he made an album about his divorce proceedings, hoping that it would tank commercially (which it did). Years later Here, My Dear is viewed as Gaye’s last great artistic statement (before paranoia and cocaine addiction took him under). “Sparrow” stands out, in part, because it does not directly reference Anna Gordy Gaye and because it finds Gaye flourishing in a musical environment bordering on early free Jazz. No doubt there was a straight-ahead Jazz album in Gaye’s future. But “Sparrow” also feels like a response to Gaye’s earlier recording of “His Eye is On the Sparrow” (1968), which remains one of Gaye’s most passionate recordings. One of the great testaments to Motown in the 1960s, is that song writers like Smokey Robinson and the trio of Holland-Dozier-Holland, were often mentioned in the same breathe as Carole King, Bob Dylan, and Lennon and McCartney. Thus it is only fitting that Gaye would put his stamp on the latter duo’s “Yesterday.” The impact of Gaye’s version could be heard decades later when Boyz II Men and En Vogue recorded version of the song, in which Gaye’s version was clearly the dominant referent.